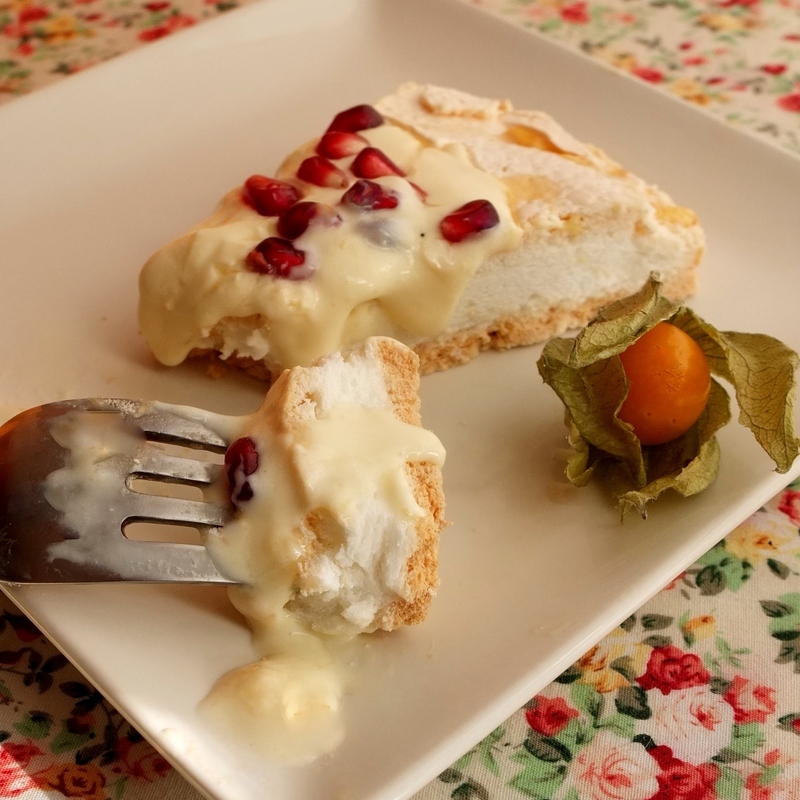 You can adapt this recipe so don’t worry if you can’t find physalis fruit, just leave it out – it’s decoration you could replace with red berries or some other fruit. More whipped cream instead of yoghurt will make your filling fluffier but my version tastes very fresh as it is. You could also add grated orange zest or a little orange juice instead of orange liqueur, and vegetarians can try agar agar instead of gelatine. 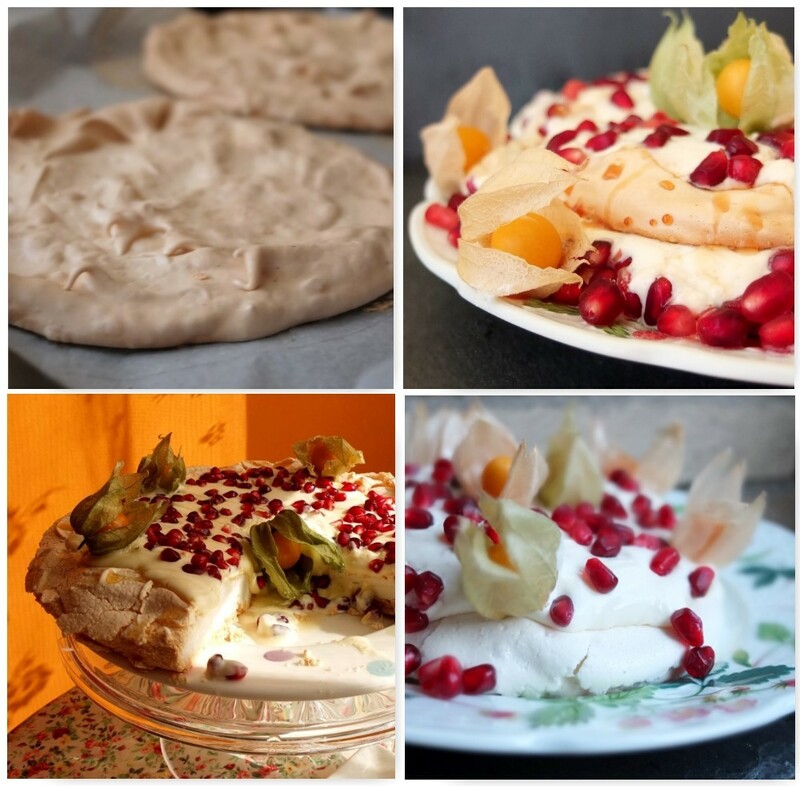 Pavlova recipes vary in their quantities, baking times or methods so you should experiment to see what works for you and be flexible because temperatures and timings depend on your oven and pavlova. The quantities are for a 23-25cm diametre circle. You could make 2 small layers (with the top layer slightly smaller than the other) as in my prototype number one. 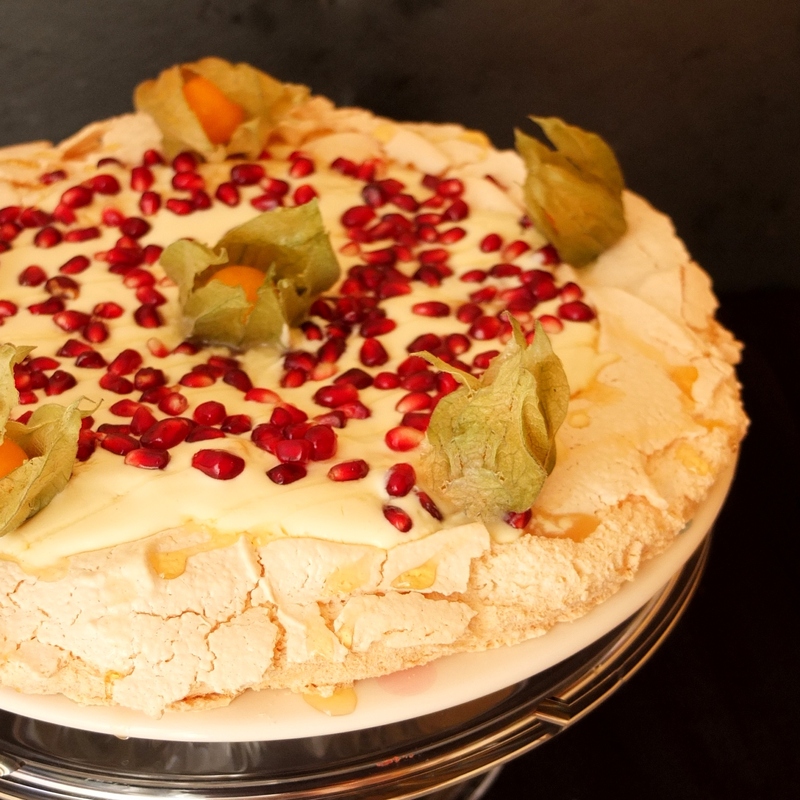 Preheat the oven to 180°C/350°F (static oven) or 160°C/320°F (fan/convection oven) then when you put in the pavlova turn it down immediately to 150°C/300°F (static oven) or 130°C/265°F (fan/convection). Line a baking tray with greaseproof paper. 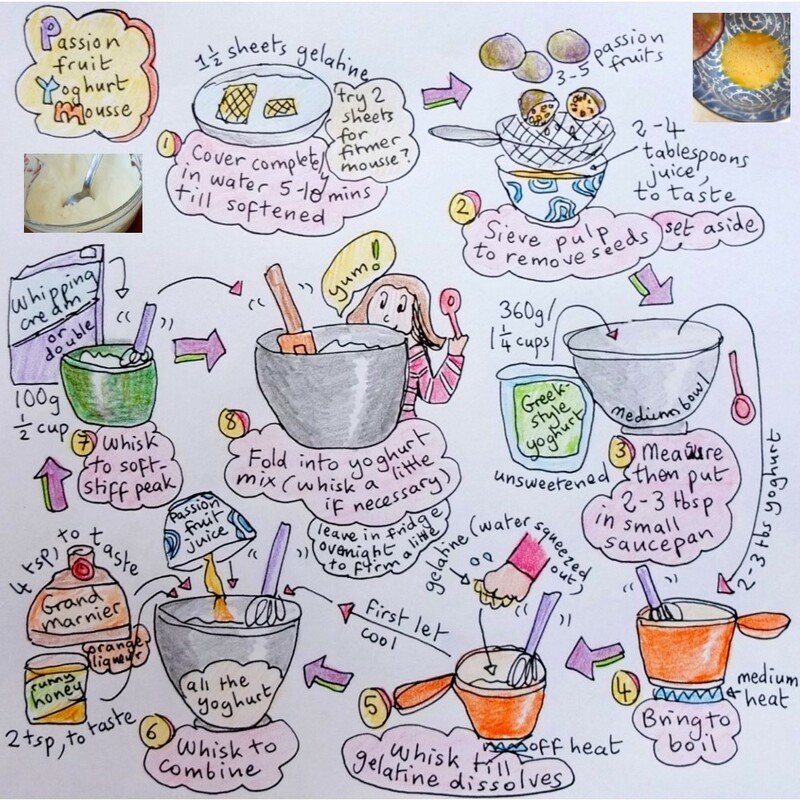 Draw your circle round an appropriately-sized plate or cake tin then turn the paper upside-down so the ink or pencil is facing down and doesn’t leave a mark on the pavlova. 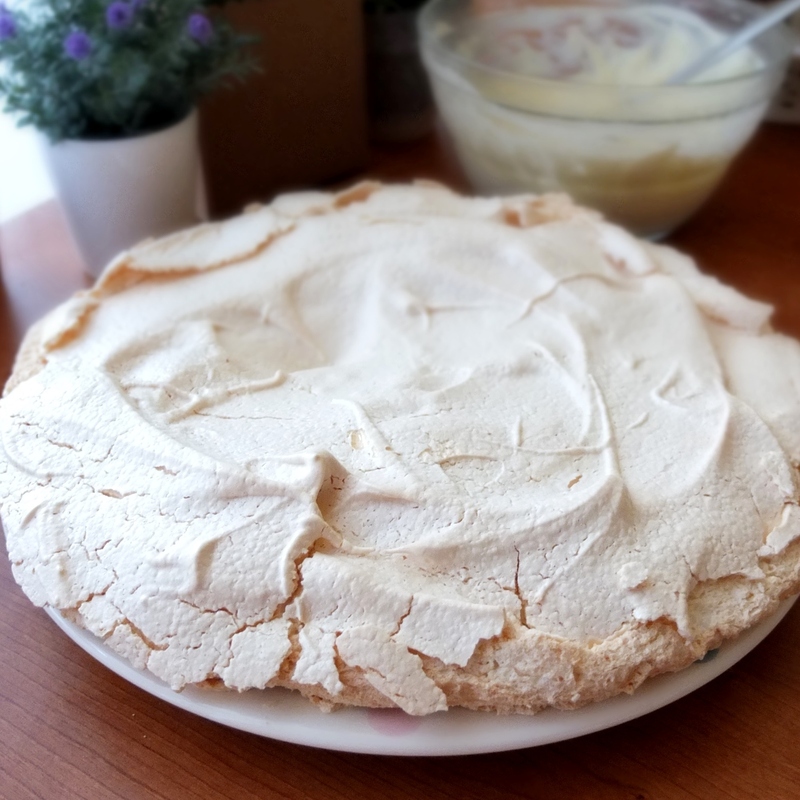 For a 16-18cm diametre pavlova, halve the quantities: 2 egg whites (80g), 125g golden caster sugar, 1 teaspoon cornflour/cornstarch, half teaspoon white vinegar, vanilla seeds scraped from half a pod or an eighth of a teaspoon vanilla extract. 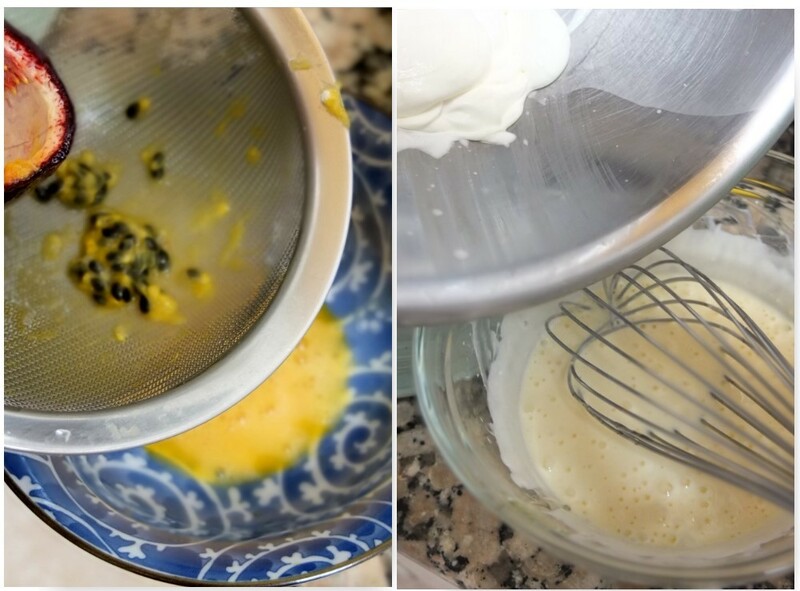 Whisk the egg whites to soft peaks that hold and don’t fall out of the upside-down bowl. Whisk in the sugar and a pinch of salt gradually, whisking well around ten minutes or more if by hand. The meringue should hold well and not fall out of the bowl if held upside down. It shouldn’t slide down your upright whisk. Keep whisking till it’s stiff enough. 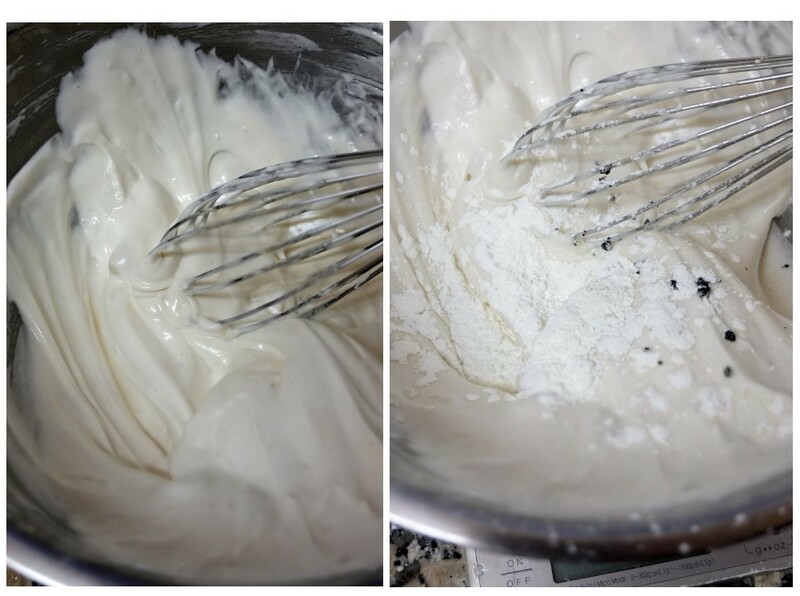 Whisk in the vanilla extract or seeds for a few minutes. Gently fold in the vinegar with a rubber spatula. Sieve in the cornflour then fold in gently till combined. If it looks like there are lumps whisk lightly for just 10 seconds or so. Use a tablespoon to make a nest with your meringue on the baking paper on your tray. You can make a slight dip in the middle where the mousse will go. Place in the lower-middle part of the oven and bake 1 to 1 and a quarter hours. It’s fine if it’s slightly browned and cracks a bit on the outside. Then leave to cool completely for at least 2 or 3 hours in the oven, sticking the handle of a wooden spoon in the door to keep it slightly ajar (open). 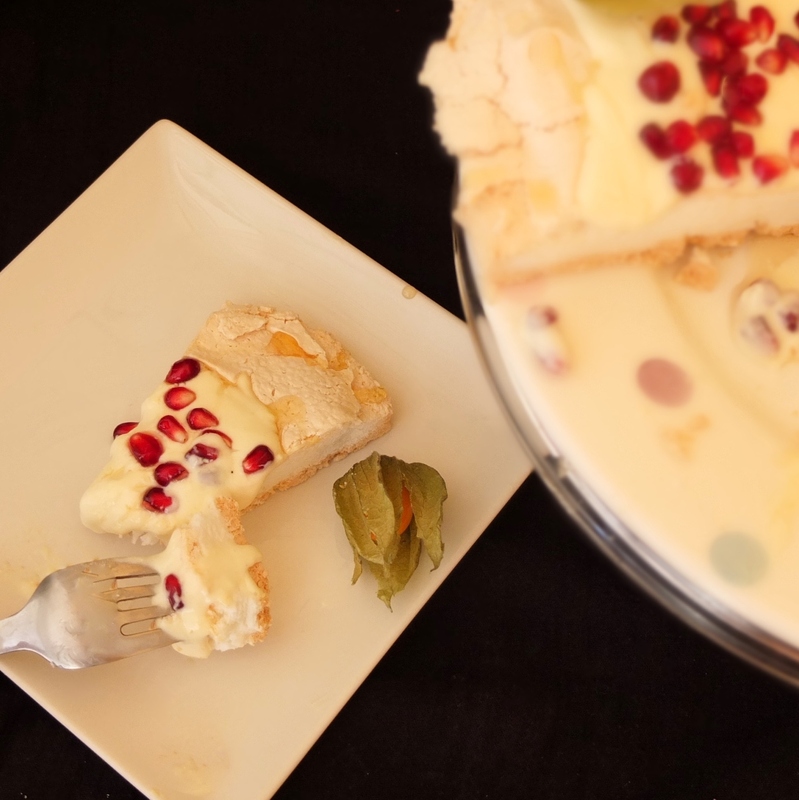 You can store your pavlova for use the next day in a metal tin or wrapped well in tin foil, at room temperature. 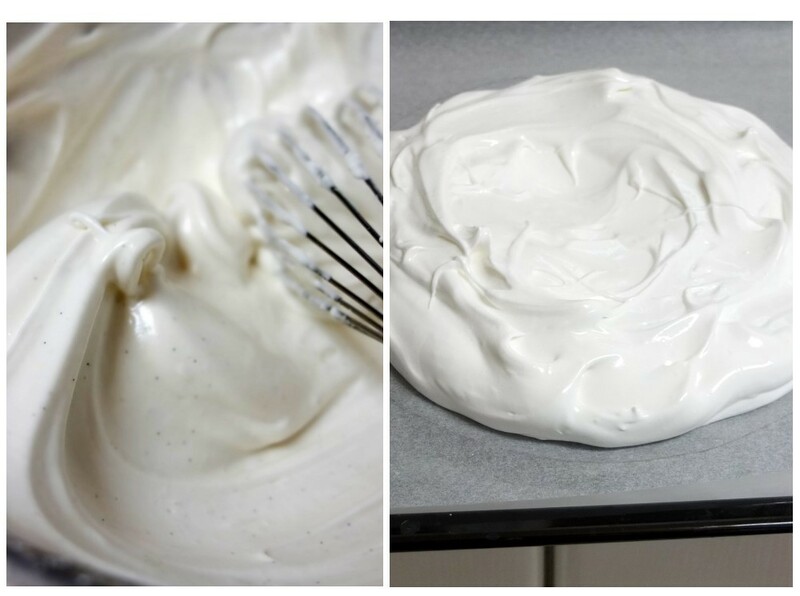 Refresh your mousse by whisking it briefly then spread in the middle of your pavlova. Sprinkle on pomegranate seeds. Drizzle with honey if you like (the extra sweetness isn’t really necessary – the prototype I made without honey was delicious). Finally decorate with the physalis fruit or berries. 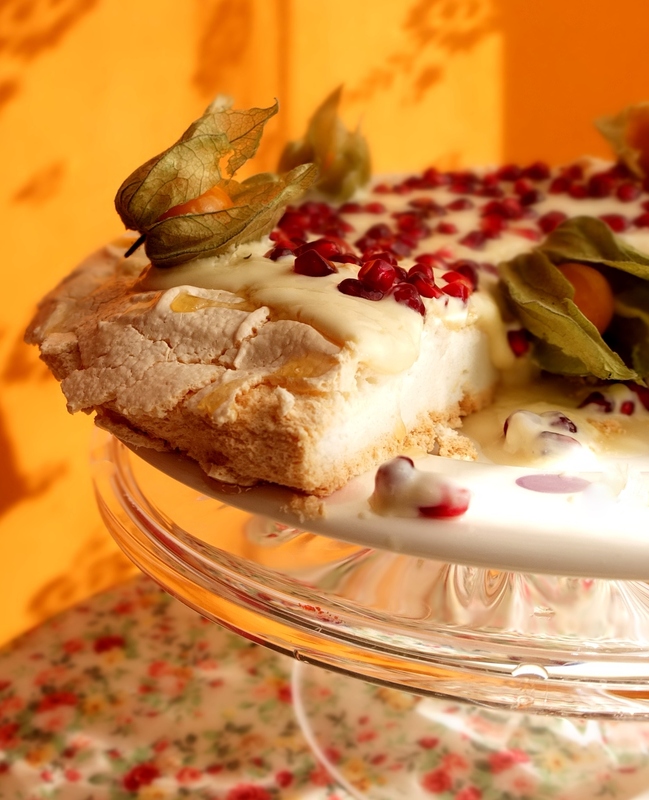 Keep your pavlova one hour in the fridge before serving, then after that it isn’t supposed to keep well. Though I love it (as do my various cake testers) after a few hours, or even a couple of days later when it’s still delicious but softer. It’s a lovely dessert, perfect for a bright summer’s day or an elegant meal. 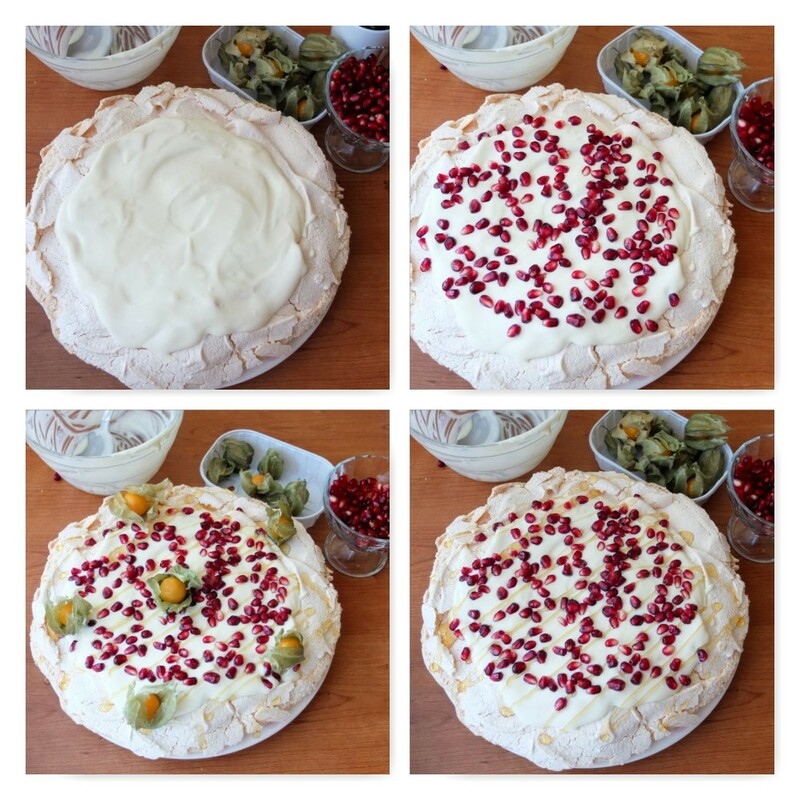 How to make perfect pavlova and meringues is an article which gives some useful background, information and tips. 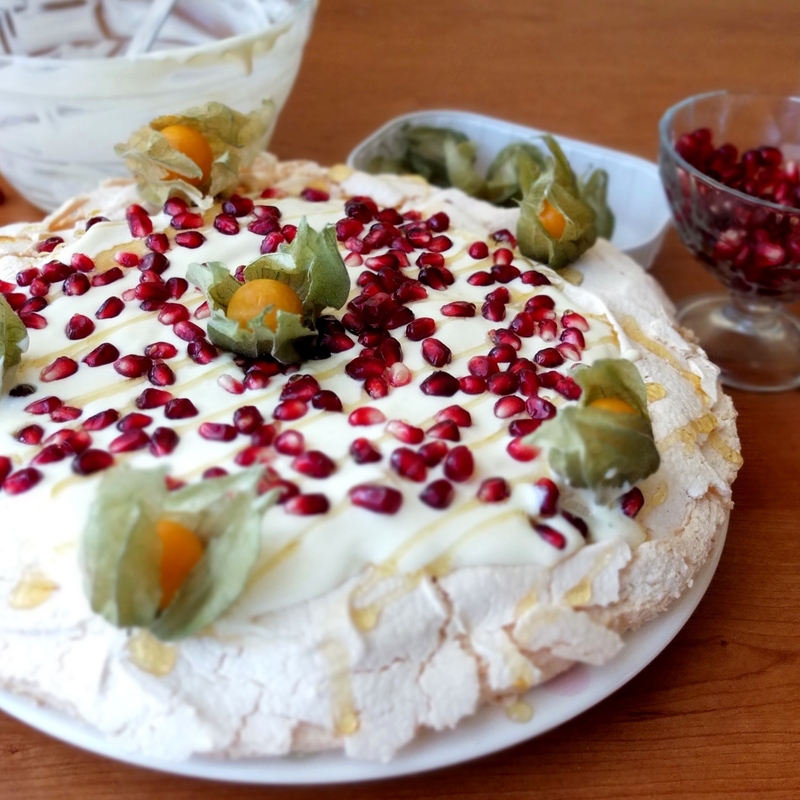 They confirm ‘Christmas and pavlova are an essential combination’ and I love their description: ‘On a hot Christmas Day … you just cannot ignore the luxurious pavlova, with its sweet crunchy meringue crust, marshmallow like centre, topped with clouds of cream, berries and passionfruit.’ Clearly they’re in New Zealand and not shivering here in cold Europe on December 25th. Still, it could make a lovely change from Christmas pudding. This dessert’s named after the Russian ballerina Anna Pavlova who toured Australia and New Zealand in 1926. Presumably it’s light and airy like the dancer, with the meringue perhaps reminding you of her floating white tutu. Mouth-watering! Great recipe to try during the holidays!. Just make a big batch of meringue kisses, and now I regret not keeping some for pavlova!